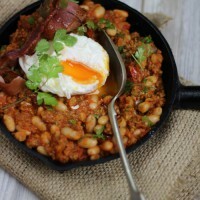 Did you have baked beans for breakfast when you were a kid? We were like some kind of Oliver Twist stage play growing up. Four children in a 6 year period and two working parents meant a sometimes chaotic wait for all things from food to to a hefty craving for attention. Mum was a teacher and in the morning she had to leave the house at the same time as us. There was no pandering to individual needs, if you put your undies on backwards you would probably be laughed at all day, cause weren’t -no -one- gonna- notice- before- you -left- home. Breakfast was a rushed affair and usually consisted of a choice of porridge or a selection of new industrial revolution quick meals. May I present for example; Tinned sliced Mushrooms in a clear thickened broth of mushroom jus atop a bed of toast, or the very popular tinned Irish Lamb stew with potatoes a la “get your own bowl, I haven’t got time to serve you” or my favourite, baked beans- always a winner when dribbled down a white shirt before the roll call bell. And such were our mornings. Stress levels would be elevated each time the vacuum cleaner made an appearance and we had to lift our buckle -ups as she mowed the carpet under the breakfast table. Mum had an unhealthy fear of being caught with a bit of fluff and some cornflakes on the carpet, and was compelled to clean the house before leaving for work. This was fuelled by Dad’s habit of dragging stray people home from work in the evening. Lord knows, as kids, we couldn’t understand the purpose of cleaning the house before work. Once lunches were haphazardly thrown together – for we never ordered from the canteen, (please don’t get me started on that)- there’d be a lot of shouting, and although we did it every morning , we were surprised to be unceremoniously bundled into the car and arrowing our way towards school. Each morning Mum would listen to 2GB and a program that included a character called Sammy Sparrow. Little Sammy was a bird and he would come onto the radio with his little song that anounced it was 9 o’clock. Each and every time he annouced it was 9 o’clock we knew we were in trouble because 9 o’clck was roll call time and here we were still in our Mother’s car, far from the school gate. I have no idea how Mum’s students ever got their names called in the morning. Most fortunately I would be sustained from this stress by my belly full of warm baked beans. This bean dish has a little bit of a spicy twist. 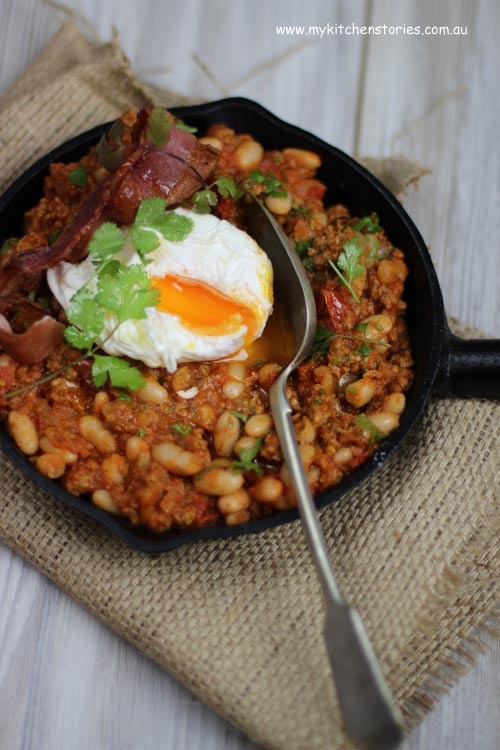 There is more Mexican chorizo than beans, but you could reverse that. There’s is not much you could do wrong with it so improvise. I was inspired to make it after being given some Mexican Chorizo. If you have never had real Mexican Chorizo then you are definitely missing out. 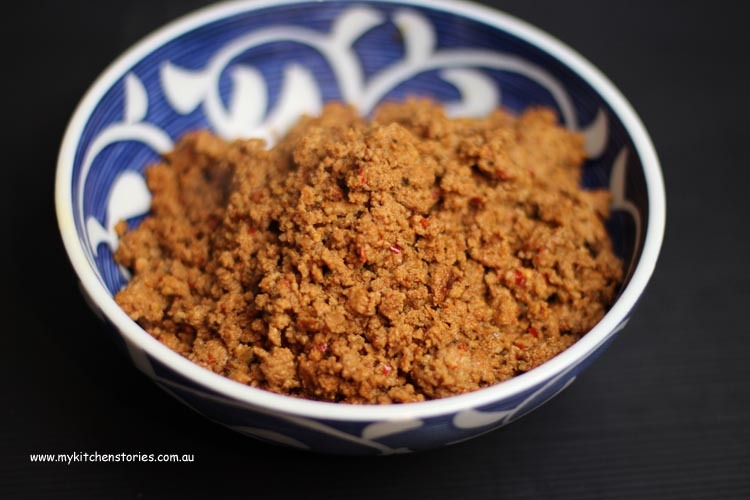 It is spicy and crumbly and can be added to anything that needs a big hit of flavour and texture. It’s no longer available here but you can find a recipe to make it . Here’s how to make here; www.honestcooking.com . Heat a Medium pan with the olive oil and add the onion, garlic and cumin and saute till softened. Add the coriander, chorizo and beans and simmer on low until simmering and well combined. Serve with crisped bacon and poached eggs. Oh – my – goodness !!! A walk down memory lane (or half run, depending on what time of morning). Great post. 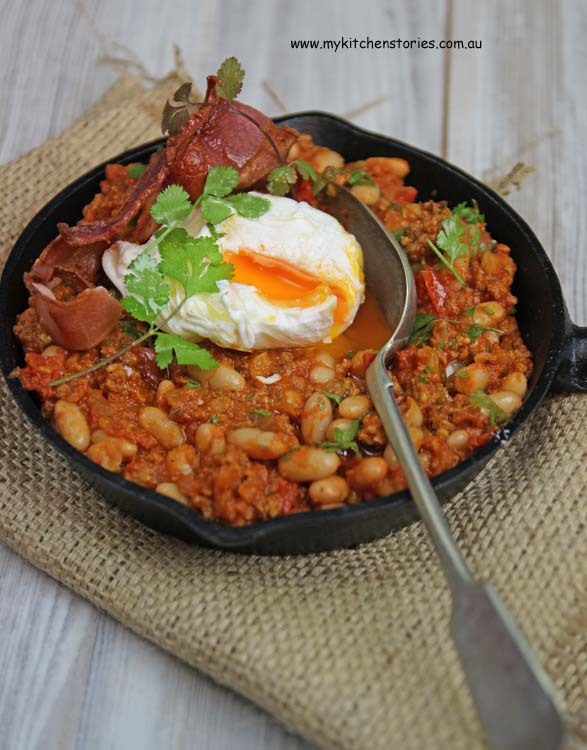 Love the look of this breakfast and particularly excited about Chorizo mince – must look into that one. What a cute story. My mother was a stay-at-home mom and she cooked a full meal for my father for lunch and again for dinner. He weighed only 128 pounds and ate all the time. I did NOT inherit those genes. My mother didn’t like to get up in the morning, so she didn’t. My father got all 3 of us up and we got our own breakfast of cereal or maybe a donut or a piece of pie. He insisted on orange juice and a glass of milk but other than those two, we could eat anything as long as we were ready when the chariot left the driveway. I never ever ate beans for breakfast. 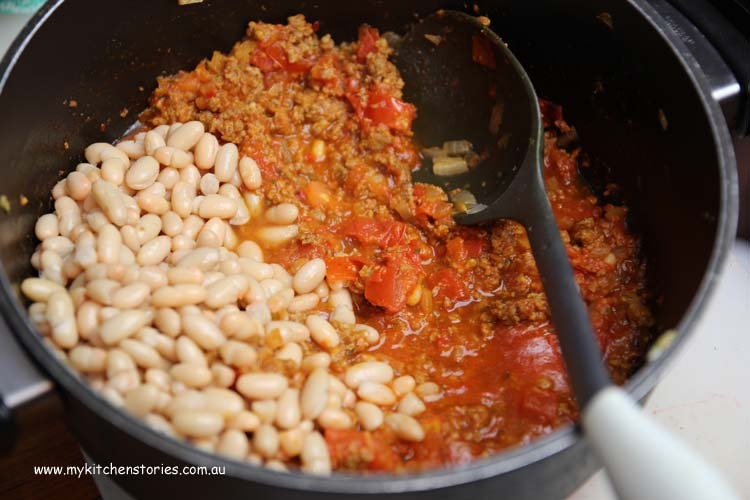 Beans were a Saturday night meal after having baked in the oven all day long in the bean pot. 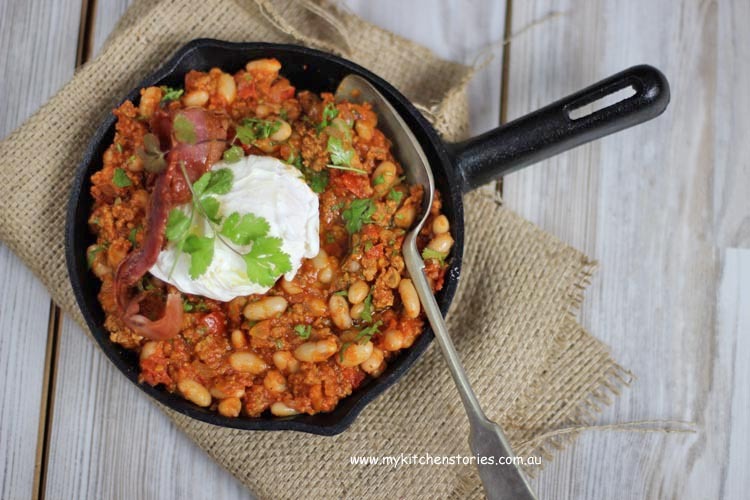 I am so making this…….I love the beans and chorizo combo. And the egg…looks delightfol. We usually had toast or cereal and fruit in my house. I’m sure mum would have cooked for us but I was a very fussy eater! We did have the occasional pancakes on the weekend. I wouldn’t have back then but now I’d love a steaming bowl of your beans! Wow she cleaned the house every morning? 😮 I can’t imagine vacuuming every day although I guess things would have been spotless! We like this idea. Almost all of our dished have beans. People love them!